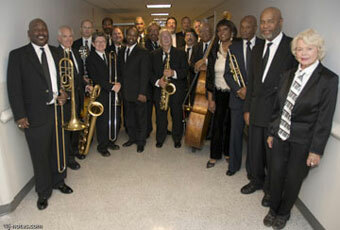 Lace up your dancing shoes and get ready to swing with the Junius Courtney Big Band and Denise Perrier at the Freight! The 19-piece band, founded in 1963 when the late trumpeter Junius Courtney moved to the Bay Area from his native New Orleans, is celebrating its 50th anniversary season and the release of a new album. Led by Junius’s son Nat Courtney behind the drum kit, directed by George “Jazzbeaux” Spencer on trumpet, and featuring special guest Denise Perrier on vocals, the band brings its impressive jazz chops to swing and blues classics as well as exciting originals. Grab a partner and Mambo, Rhumba, Bolero and Cha-Cha-Cha your way to a great Saturday night. Denise moved to Oakland from Louisiana as a girl, joined a group called The Intervals, and played Las Vegas as part of Louis Armstrong’s retinue. Since then, she’s toured the world and recorded six albums, the latest of which is Denise Perrier and the Novosibirsk Philharmonic Orchestra. After 50 years of making music in the Bay Area, this big band is still delivering big fun, transporting audiences to the delirious realm of swing!